Instead of moving into the guest cottage I was preparing, and then simply selling the huge house (maximizing value of the additional lot and bringing the sale price better into line with the neighborhood), at the eleventh hour I learned that the property must be sold undivided. If this year has lessons, the first might be “Don’t get too comfortable”. The second might be that loss and grief are under-rated, at least where adaptability and cunning can be brought to bear. I remain so grateful to the many people who’ve been so helpful in such difficult circumstances. Selling the best house in my old St. Johns neighborhood was a challenge, and the timing was ghastly. Ian was a huge help in finishing the sleeping porch bathroom, and several other last minute projects, and I left this house as polished as the previous two. But where they had sold in a combined 36 hours, this house would take 4 months of opportunistic lowball offers, 2 price reductions and 3 fake-outs from the same inept and vacillating Wyoming couple. I finally found the woman who needed to own my house – or, more accurately, she found her house. Rene Denfeld, bestselling author, journalist and private investigator wasn’t even looking for a house when she found mine. But she quickly realized it was the home of her dreams, made a very strong offer in a weak market, sold her old house in Overlook on faith and prepared to move. But the very same banks that we American citizens bailed out a year earlier decided they couldn’t possibly loan her money – not even with a 70% downpayment! And of course the appraiser undervalued the house by 80k too. And code that was utterly ignored when we bought the house in ghastly condition was suddenly de rigueur now that the house was glorious. The system is becoming increasingly diabolical, and I caution any of you hoping to sell your home that you might be in for some rude surprises. And the more exceptional your abode, the worse your circumstances are likely to be…. With Rene’s help and forbearance, we finally got the deal done. But no lesser buyer would ever have persevered. I spent the entire morning of my move to Hollywood* at the City Planning Office. My brilliant German architect friend Rene Bernt had helped me draft plans so that the house could actually be sold. I cannot imagine the difficulties of the year being overcome without the wonderful Renes. I later took Rene D. an antique oak mirror as a housewarming gift (I’d found upon moving into the house 8 years earlier and my father had restored to beauty. It belonged with the house). When I knocked on the door, the first sound I heard was the laughter of children upstairs. Rene has three wonderful foster children, one of whom declared the house “a mansion” upon her first visit. On my most recent visit Rene showed me the idyllic waterfall she had created in the back yard. The sound of water makes the back porch irresistible, and her landscaping skills complement all the work I (and my talented neighbors) did on the “mansion” over the previous 8 years. In order to stage the house for sale, all the interstitial rugs had to be stored away. To keep the refinished floors safe, Lego went to stay temporarily with my folks. But that ended when my Dad’s multiple strokes and my Mom’s broken hip left him without any place to be. After that Lego was cared for by the wonderful Dan and Alison, and he played with their adorable black beast Reuben for a couple weeks. At the end of that time, I knew that A) the house wasn’t going to sell quickly. B) I had no idea where I’d end up living. And C) Lego deserved a family to love him forever. The first person I told that Lego needed a good home was Wendy Reznicsek of the Northwest Children’s Theatre. After a couple weekend visits, she and her family of four adopted Lego. He lives today in doggy splendor in rural Hubbard, south of Portland. I miss him of course, but my loss is his gain. My brilliant sister-in-law Erin proved the family’s MVP and heroically stepped in to help my parents while I strove to do my best elsewhere. There are no thanks sufficient to the magnitude of her grace. I’d largely stopped traveling to shows, but when the kind people of Santa Clara invited me to be their artist guest of honor at BayCon last year, it inspired me to get out more. So this year I traveled to San Diego twice, Reno, Redmond, Corvallis and even the Columbia Gorge. I hope to continue this sort of schedule next year, though October’s 3-weekends-in-a-row was a little more extreme than even I found enjoyable. Jeanette Pelster invited me to speak with her high-tech art and design students my brothers old alma mater, Benson Polytechnic High School. It was an amazing collection of technology in the service of education – I can only imagine how different that classroom was back in the day. This year saw the release of my Literary Pin-Up Calendar – I’d created it 4 years ago, only to find that Calendars were “a dead product”. Outside a few big behemoths, no one wanted to publish anything with such a short shelf life – no matter how much they liked the work itself. Happily Kat introduced me to her old friend and employer Pat Rothfuss, author of The Name of the Wind. And much to everyone’s surprise, Pat published the calendar through his charity Worldbuilders, and all moneys spent on the calendar go directly to Heifer International. So, working closely with Pat’s assistant Valerie, I revised all the dates, edited and prepared the files for print. I’m delighted with the results, and I hope I might make the calendar a yearly event. If you haven’t purchased one, for yourself or for a friend, I hope you will. Every dollar helps! I’ve remained a freelancer this year after the strange company I was working for disappeared. It was nice to stretch my old Art Direction muscles in that job, but better still, I was reintroduced to the talented and delightful Lynn Gesue, an old colleague from my days at Magnet Interactive. Caitlin R. Kiernan has been my pole star this year – I did two covers for her Subterranean Press books Two Worlds and In Between: The Best of Caitlin R. Kiernan, (Volume One) and Confessions of a Five-Chambered Heart (even as friends Kyle Cassidy and Steve Lieber worked their photographic and comic magic for her). Caitlin is an amazing writer and I hope every year will feature a collaboration or two. Other book covers this year included short story compendia The Door Gunner: The Best of Michael Bishop and A Stark and Wormy Knight: Tales of Fantasy, Science Fiction and Suspense by Tad Williams. I was interviewed and given a profusely illustrated 8 Page feature in China’s Top Artist Magazine, as well as the front and back of a cover. Strange to see my words in Chinese, where proofreading is impossible, but I love the idea of having my work seen in Asia. The other big project of mine that was finished this year is my game The Doom That Came to Atlantic City. Keith Baker was his usual brilliant self and made its ever-changing mechanics clever fun. I redid almost all of the art. Paul Komoda brought his exceptional Lovecraftian sensibilities to the 8 playing pieces. And we sold it to the well-regarded Z-Man Games. But just before it went to press, the game company was sold to a European concern that was not as vexed by Monopoly as we Americans are. And the game is now officially homeless. A shame since we know so many people interested in buying a copy, but given my calendar’s eventual publication, I’m hopeful that the time will come when its stars are right too. I’m currently at work on a secret game project that has taken me to Seattle several times this year. I look forward to talking about it in this, my new journal, when I can. But for now mum’s the word. Better to mention the six great games I played at Ambercon NW between sessions in the soaking pool, and the ongoing collaboration between Dan Garrison and Zephy McKanna. I have been very lucky to play with such stellar talents this year, and hope to again next. Especially when Keith and Jenn rejoin us following their Austin adventure. I’d introduced Keith Baker to Jenn Ellis two Christmasses back. It was a blatant set-up, but a sincere and effective one. Their marriage was a highlight of the year. Knowing they were to be married at the Kennedy School, I asked my many friends with paintings there if they had included subtle things in their works or knew any secrets that would make a wedding Scavenger Hunt a success (Paul Guinan‘s Boilerplate hiding in the Boiler Room for example). Christopher Robbins put me in touch with the sublime Lyle Hehn, a man I’d wanted to meet since first moving to Portland a decade ago. Lyle is the reclusive artist, type designer and Art Director for the McMenamin’s and his tour of the school showed me such interesting details of his, and others, work. I asked if I might commission an original 8.5″ by 11″ ink piece for the happy couple, but he preferred to paint a big smooth river rock instead. Could I find pictures of the bride and groom as kids? I knew Keith’s family, and happily, Jenn’s was equally cooperative. Lyle’s painting was just the thing – it was my gift to the couple, and I used it to make the signage for the event itself. In exchange, I’ve painted Lyle’s ink drawings of his fine daughters as Christmas gifts. The other big wedding of the year was my brilliant friend Adam Danger to Traci Cook at the Cornelius Pass Roadhouse. Jason came up from LA and we groomsmen looked sharp in our chocolate tuxes and brown Chuck Taylor hightops. Thanksgiving with Kyle, Trillian, Roger and Carolee was a wonderful sequel to their visit of two years earlier. Thank goodness for guests! While the others stayed home and finished preparing the feast, I took a trip to the ER with Carolee and I learned that my fall down the back stairs hadn’t broken my hand after all. Whew! Selena Coppa was my guest when she came to Portland for a big IVAW function, and for my new neighborhood’s annual street party. Other delightful guests in the four-bedroom Craftsman bungalow I’m renting included the Barker ladies, Nate, Melissa, Anna, Rob, Scott, Robin and Venetia. I hope to see more travelers in 2012. This house wants a lot of life inside its lovely walls. Other highlights: Conflict Resolution class with my dear high school pal Cary Morrison, Dinner and dessert with Amy Crehore and Shawna Gore, Hugo-winning author Mary Robinette Kowal‘s holiday soiree, many meetings and collaborations with Nebula-nominated Felicity Shoulders, The Portland Juggling Festival and a splendid lawn party hosted by the Cantor Jonases. I’ve learned so much from my friends this year that I feel a little like Dorothy in the Wizard of Oz. Everyone has important knowledge and wisdom, and it has been a great honor to share it. I feel like I’ve left a lot out, but anyone patient enough to have read this far is probably grateful for that. I wish you and yours the very brightest of this dark time. PS: This will be my last massive Holiday note. Rather than trying to sum up, I think I’ll try to communicate throughout the year in this Journal format. Please join me here in my future ramblings if you are so moved. 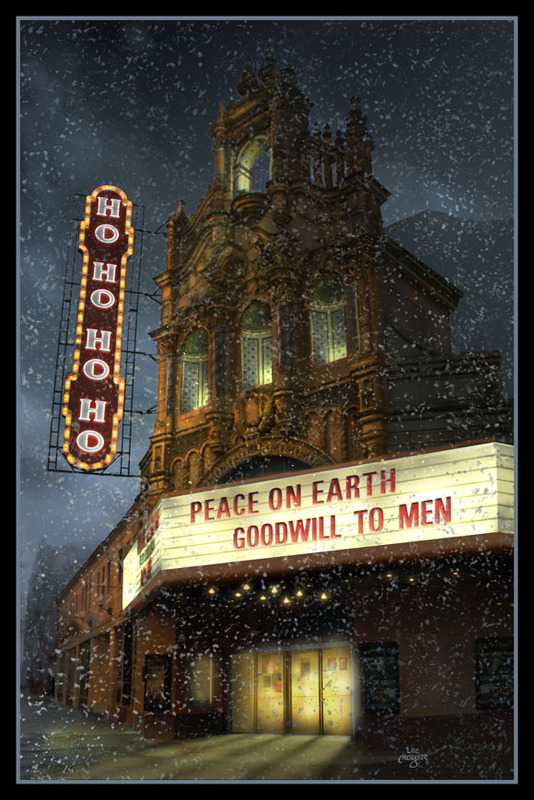 *The Hollywood in question is the Portland neighborhood that was named after its theatre (shown on my card this year), as opposed to the more famous version marked by the remains of the Hollywoodland development sign.